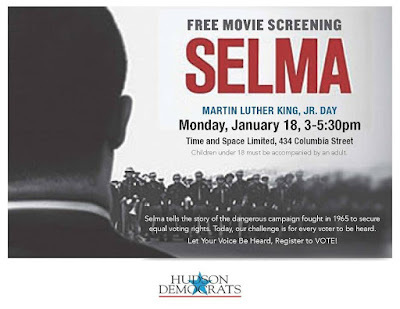 Hudson City Democratic Committee screens Selma. Admission is free. Seating is limited and on a first come basis. In 1965, an Alabama city became the battleground in the fight for suffrage. Despite violent opposition, Dr. Martin Luther King Jr. and his followers pressed forward on an epic march from Selma to Montgomery, and their efforts culminated in the Voting Rights Act of 1965.